We are delighted to announce that Holderness Health has been chosen as the name for the new practice from 1 October 2018. This new practice will now be made up of Church View Surgery, Hedon Group Practice and ourselves as Eastgate Medical Group in Hornsea have decided not to go ahead with the planned merger. Please note we no longer accept telephone requests for repeat medication. This is to prevent mistakes and allow our team to dispense medication with less interuptions. This will allow them to provide you with a better service. You now have one number to call to reach us 01964 613221- please listen carefully to all the options to help us direct your call efficiently to the correct department. 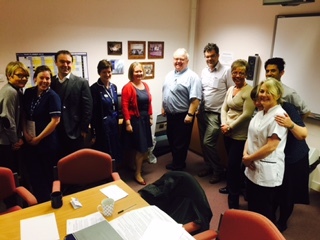 In April 2015 a group of Doctors, Nurses and Administration staff from the surgery completed Dementia Friends training. A Dementia Friend learns a little bit more about what it is like to live with Dementia and then turns that understanding into action. As recognition of this worthwhile training we were awarded with a certificate by MP Graham Stuart. Award Winning Long Term Conditions Clinic - please see the link to our video on the righthand side listed in our further information, to watch more about our nationally acclaimed service we offer to all patients with more than one Long Term Condition. You can book or cancel appointments and manage your repeat prescription using the links below. To use this service you must obtain a username from the surgery.